The Caribbean is home to 26 countries and territories, comprising of about 44 million people. The region’s population is similar to Argentina, Ukraine, or Uganda (2017). 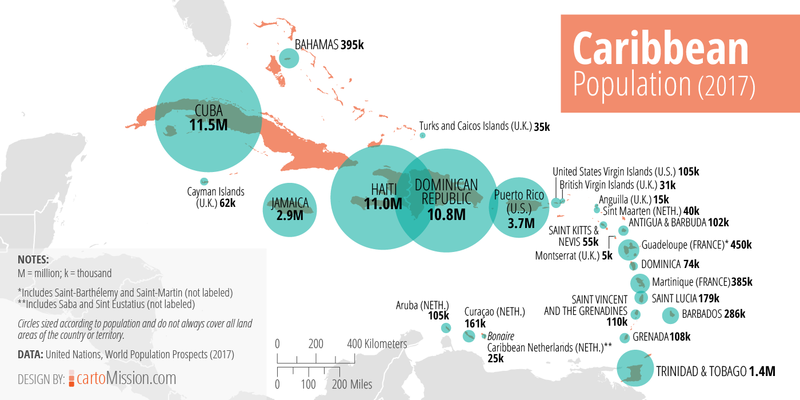 Countries or territories with populations of 1 million or greater include Cuba (11.5 million), Haiti (11.0), Dominican Republic (10.8), Puerto Rico (3.7), Jamaica (2.9), and Trinidad and Tobago (1.4). There are 11 countries with populations between 100,000 and 450,000, and 9 countries with populations less than 100,000.